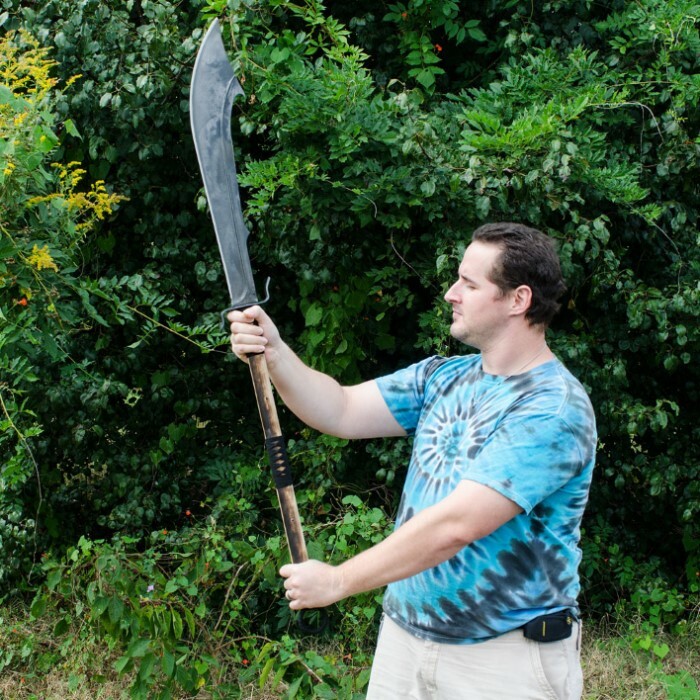 This massive naginata sword is packing one of the most aggressively designed scimitar blades we've ever seen! 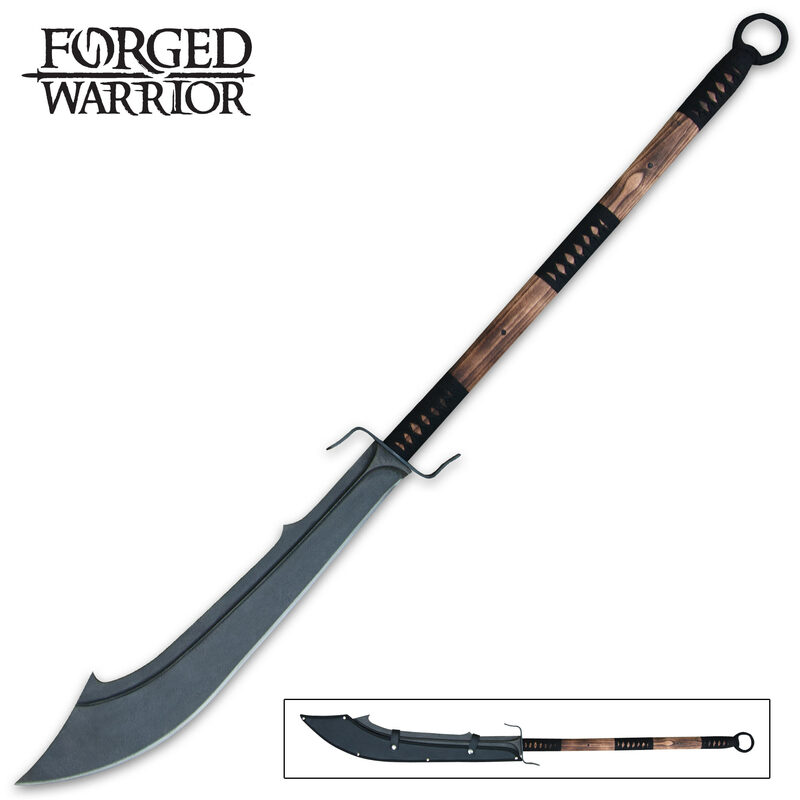 Forged from carbon steel, the blade is thick, features a unique blood groove, and is accented by two spikes along the spine. The Dadao style guard and ring are made of steel. Includes protective sheath with snap closure. The blade measures 25 in. and this piece is approximately 53 in. overall. WOW!! UNPACKED THIS BEAST ASAP AND WHACKED AN OAK STUMP WITH IT. BIT RIGHT INTO THAT WOOD. STURDY , SHARP, AND BEAUTIFUL! should only be used for decoration. I was doing practice swings with it and the handle started cracking right under the hilt guard, this being only the second day I've had it. the blade is really nice looking and sharp, and should the handle have held up it would have been a really great weapon. Ultimately I'm happy with this as it will likely be used only for display. However, the wood used for the handle - EXTREMELY SOFT! It feels like holding a piece of styrofoam and actually compresses under the pressure of my grip. I am quite certain that the handle would split or snap in two if I swung it at anything remotely solid. I've replaced wooden handles before but, it an extremely time consuming craft. That said, if i took the time to retrofit with a proper handle, i could probably chop down a tree with it. The weight of the blade is great and the sheath is nice. Im second to review this item. Im just gonna say its awsome. guess i'm the first to review this Naginata...well let me see if i can help..i'm 6"1 and the whole thing comes a little below my shoulder..it's heavy and it feels solid and the blade is not sharp...another day of sharpening for me...lol...but it's relaxing... the sheathe is really good and well put together..no problems..no chips...no bends...even though my first choice is a sword i wouldn't mind this being my second choice...it will definitely help speed up your sword play and your handling...the shipping was fast and accurate and i just want to thank my loving wife for getting this for me...i love you Deborah, thanks sweetie and trueswords. This blade is heavy, blunt, and harsh..! I had fixed this sword for three days! Don't buy it if you don't how to fix the sword! this blade is awesome granted the handle is a little bit shoddy but some gorilla tape fixes that. 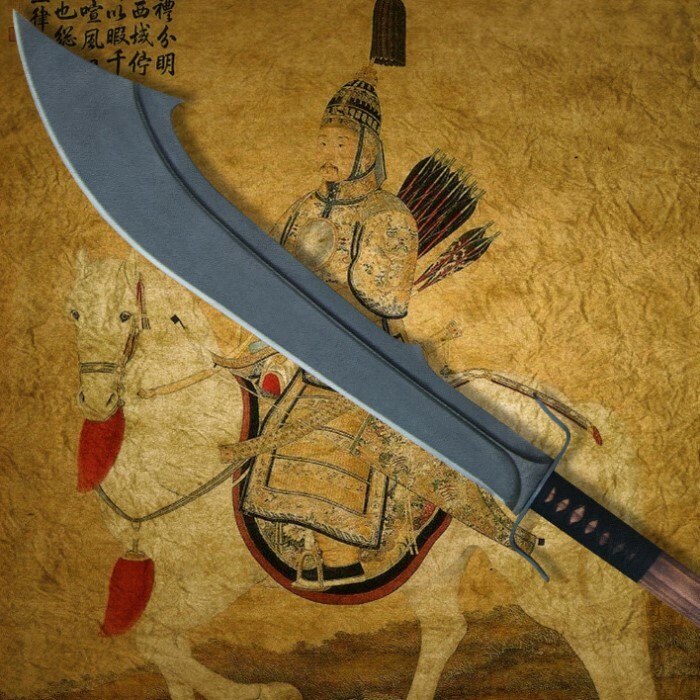 i turned mine into a Chinese war sword but i modified the blade slightly so now it looks like it would be a nightmare to be hit with. all in all awesome blade for the price. i also took it out side and hit a log with a diagonal strike and in cleaved straight through. as for the name of the modified blade its now called the nightmare relm. Handle could definitely use some reinforcement, especially around the tang (considering it's quite small for such a large blade) my handle began to split after a few swings (never hit anything with it) but some electrical tape fixed that. overall for the price it's not bad at all it is quite sharp and handles nicely. Looking for a Head Chopper? Well my friend look no further, this is it.